Get Your Next Brakes Service done by Affordable Auto Services - we are open all day Saturday. We offer a comprehensive brake service - regular brake repair and maintenance work is essential to keep your brake systems working optimally for safety and performance. For new brake pads, brake discs, brake drums, a brake service, or a hand brake service we've got you covered. From the brake pedal to hydraulic brake fluid, brake master cylinder to power brake booster, drum brakes to disc brakes and electronic anti-lock brake sensors, our technicians know every part of your brake system inside and out and can perform brake repairs on any make and model. Brakes are sensitive to heat, water and moisture, and the pads and linings wear every time you put your foot on the brake pedal. Inspecting and rebuilding or replacing brake callipers. Resurfacing or replacing rotors or drums. Inspecting and repacking or replacing wheel bearings. Inspecting backing plates and all brake lines. Replacing all hardware and spring kits on drum brakes where needed. Inspecting and replacing wheel cylinders or master cylinders. Flushing the entire brake system. To arrange for a brake check simply contact us to book your vehicle in. Feel any drag? Be alert to brakes that seem to stick, wheels that are hot or an engine that seems to lose power. The brakes may be failing to release; alternately, the condition could reverse, leaving you with no brakes at all. There's a pull. Does the vehicle pull to the left or right when brakes are applied? Make sure tyres are fully inflated. If the pull persists, it's time for a professional to check the brakes. Stomping on the brakes? It should not take extreme muscle power to make the brakes work. This "hard pedal" symptom, when the brake pedal nearly touches the floor before engaging, can indicate brake trouble. Brake light is on. There are several reasons the brake light is illuminated on the vehicle dashboard. The problem could be simple: brake fluid could be low. Or, it could involve a hydraulic system failure. Shake, shake, shake. Can you feel the brake pedal, steering wheel or your entire vehicle vibrating, pulsating or shaking? This may indicate a problem with disc brake rotors or a faulty steering mechanism. There's a racket. Brakes should operate with very little noise. Don't ignore squeals, screeches, grinding, groaning, chatter, clatter or bangs. Your brakes may need repair. Grab. "Touchy" brakes that grab with the least bit of pressure may indicate that brake linings are contaminated with grease or oil, or a component is broken and could fail. What type of brake system do I have? Drum brakes revolve with the wheel. 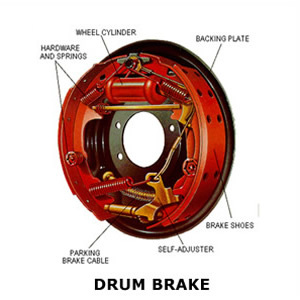 Brake shoes, with linings attached, are situated inside the drums and when pressure is applied to the brake pedal, hydraulic fluid in the braking system forces the brake shoes outward until the linings come into contact with the inside of the drum and force it to stop. 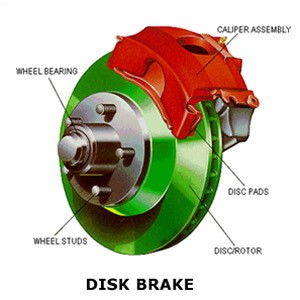 Disc brakes have a stationary hydraulic calliper, with a disc revolving with the wheel. When the brake pedal is pressed down, hydraulic pressure forces pads in the calliper to clamp on the disc, much like the operation of a bicycle brake. Most late model cars have disc brakes or a combination of front disc and rear drum brakes. Brake fluid, also known as hydraulic fluid, is responsible for moving the various components of your vehicle's braking system. It operates under high temperatures & high pressure, without it, your vehicle would not be able to stop when you push the brake pedal. Brake fluid is hygroscopic - it absorb moisture from air - when brake fluid starts absorbing moisture the boiling point of brake fluids drops and braking efficiency deteriorates. In addition to these primary braking systems, most of today's vehicles utilise an electronic Anti-lock Brake System. Using electronic sensors and high pressure pumps, under certain conditions, your ABS system can measure vehicle speed, wheel slip and brake force. Then it actually pumps the brakes for you during an emergency stop. Brake squeal can be caused by pads vibrating, clips losing tension, poor pad fit or a damaged pad. A grinding noise is more serious – your brake pad has completely worn away. Either way, your brakes need attention. Why does my brake pedal feel spongy? Why does my car pull to one side when I brake? You could have a hydraulic, mechanical, steering or suspension problem. Bring your car in for a thorough inspection soon. At least as often as your owner's manual suggests. Brake fluid should be flushed every one to two years - our Brake Inspection Service will let you know if your brake fluid needs changing. You also need to change your brake fluid if it contains too much copper. Copper is measured in parts per million, and the industry-accepted limit is 200 ppm. Any more than that and the fluid no longer meets design specifications and should be replaced. All brake systems wear out (brake pads and rotors wear down) – how quickly depends on your driving style. Cars that drive in town with lots of stopping & starting will consume brake friction material much faster than cars that drive primarily on highways. Vehicle loads are the other factor. The heavier your car is, the more braking power it requires to stop. Frequent, hard braking will shorten your brake life. "Thank you so much to the whole team at Affordable Auto Services!! I understand that customer service is of high priority these days and I received the best experience from you all! Thank you for having courtesy cars available for your customers, and thanks so much for fixing everything on my car... will definitely be referring all my family, friends, and my own customers to you's from now on..."
"These guys know their stuff!!! Took for a drive and instantly told me what was wrong and quoted what it would cost. Final cost was far less than quoted. Gave me a ride back to work and picked me up when it was ready.. Great team and 5 star customer service. Would definitely recommend." Contact us today through phone or email to book your vehicle in.